I first attended the Biola conference 7-8 years ago, when there were only about 100 attendees. Last year I believe there were more than 700 – a pretty good indicator of the growth in interest in Christian film. Sounds funny! Can’t wait to see the other characters. That is awesome! I cannot wait to let my daughter know about it (she’s 3 1/2). I cannot wait for the look on her face when she learns about God through different charaters! I think it is great what you are doing for these kids, you are much more of an inflence then I think you wll know this side of heaven. Hope you have a wonderful time! We’ll be praying for success and favor! Winnie did the driving?? Oh dear, how did she see over the steering wheel? Agnes and Winnifred look wonderful! Thanks for sharing that with us! We will continue to pray. We look forward to more sneek peeks! Very cool. Have a blast and congrats on the Briner Award! Okay, that Mother Teresa quote is going to rock my world. Hey everyone, don’t forget: tomorrow is Jelly Telly Tuesday! Let’s all be praying! Congrats on the Briner award! Hey, Agnes and Winnie look awesome! Makes me wonder what kind of “people” the other characters will be! Hope you have a good time in LA! I’m ready for another JellyTelly Tuesday! Oh, I forgot to add something: I’m loving all the quotes, especially the Mother Teresa one. One more comment… I was reading the Veggie Tales Review, and they said that they had turned on what was supposed to be Veggie Tales on Qubo, but instead it was some animal safari thing, but 3-2-1 Penguins had been on. Did they finally pull the plug on the show? If so, why did they leave 3-2-1 Penguins? Macy, I checked the Qubo schedule online and it says that VeggieTales is on after 321 Penguins. wasnt it on before in the past? I have been out of the blog loop for awhile, but have had fun catching up! 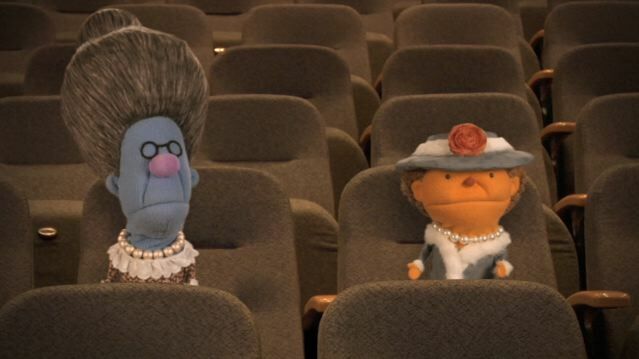 The puppets look great! They kind of remind me of the two old gents from the Muppets. I used to love their banter on the show!! We continue to pray for your funding to come through. Your potential audience numbers are building and anticipation seems high. Lookâ€™s like Godâ€™s letting everything fall into place. How awesome! Thanks, Jonathan. The guy from the Veggie Tales Review probably just had it on the wrong station. I didn’t watch Qubo last week, so I was kind of concerned. I look forward to hearing Agnes and Winnie’s voices.